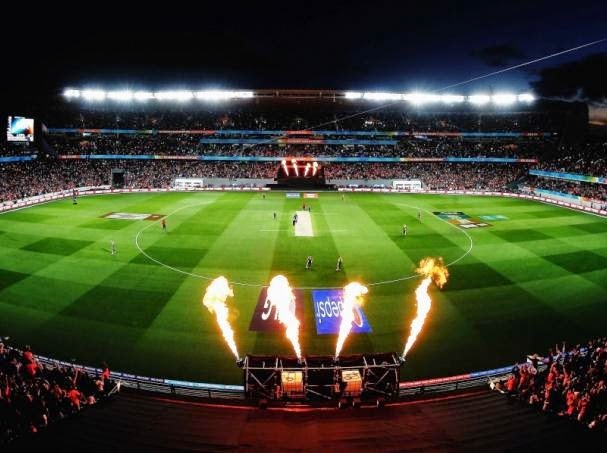 Grant Elliot (84 not out) helped New Zealand reach their first ever cricket World Cup final as they overcame a spirited South Africa by four wickets via D/L method in a thrilling and rain-curtailed first semi-final at the Eden Park here on Tuesday. Faf du Plessis (82) and captain AB de Villiers (65 not out) took South Africa to 281/5 in 43 overs. Rilee Rossouw (39) and David Miller (18-ball 49) also contributed to the total. Rain halted play after 38 overs of the Proteas innings and continued for more than 90 minutes. It reduced the match to 43 overs per side, also forcing Duckworth/Lewis (D/L) method to peek in. As per the D/L method, the target was revised and the hosts needed 298 in 43 overs. In reply, New Zealand got over the line by contributions from skipper Brendon McCullum (26-ball 59), Corey Anderson (58) and Elliot (84 not out). Leading from the front, McCullum (26-ball 59) blasted eight fours and four sixes to give his side a flying start. He notched up his 30th ODI half-century. But when he and his deputy Kane Williamson (6) were removed by pacer Morne Morkel, New Zealand were in trouble at 81/2 in nine overs. Opener Martin Guptil, who scored an unbeaten 237 in the last match, scored 34 and got involved in a 47-run stand with experienced Ross Taylor (30). Hashim Amla and wicketkeeper Quninton de Kock joined hands to run out Guptill and soon, off-spinner Jean-Paul Duminy got rid of Taylor. The two quick dismissals left the hosts on backfoot at 149/4 in 22nd overs, still requiring another 149 runs. It was then that Anderson and seasoned Elliot repaired the damage. They ensured that New Zealand remain in hunt as for as the run rate was concerned. Their crucial 103-run partnership ended when Anderson, who scored his fourth ODI fifty, skied a Morkel delivery to du Plessis at square leg. With 46 runs still needed from five overs, wicketkeeper-batsman Luke Ronchi scored just eight. South Africa would rue their missed chances. De Villiers and wicketkeeper de Kock missed the run-outs of Anderson and Elliot at critical moments of the match. Jean-Paul Duminy dropped the catch of Elliot. With 12 required off the final over, Dale Steyn conceded six runs in the first three balls. Later, with five needed off two balls, Elliot, 33, pulled off a big heave towards deep mid-wicket to win it for the home team. Daniel Vettori (7) remained not out. With this loss, South Africa now have lost their fourth semi-final, while the home side has been lucky in their seventh semi-final appearance of the World Cup. Earlier, du Plessis, who scored his 15th One-Day International (ODI) half-century, held the innings together. The right-handed batsman was involved in a crucial 83-run stand with Rilee Rossouw (39) for the third wicket. That set up the game for the big-hitters like de Villiers and David Miller. Left-hander Miller bludgeoned his way to a 18-ball 49 and fired the team to 281/5 in 43 overs. At the start, South Africa openers Amla (10) and de Kock (14) failed to make the best of New Zealand's generosity. In the fifth ball of the second over, left-handed de Kock edged a pacer Trent Boult delivery but wicketkeeper Ronchi failed to collect it. In the second delivery of the third over, right-handed Amla also got a reprieve as he pulled a Tim Southee ball only to be dropped by Boult at fine leg. However, Boult made amends by removing both the batsmen. The left-arm seamer rattled Amla's stumps before de Kock offering a catch to Southee. At 31/2 in 7.5 overs, Rossouw (39) joined du Plessis in the middle and the duo eased the pressure with sensible batting. The left-right combination stitched an 83-run partnership for the third wicket. After Rossouw fell, de Villiers and du Plessis started their show. While du Plessis held the innings together, de Villiers was at his destructive best, finding boundaries at will. Du Plessis took 85 balls to complete his fifty, while his skipper needed just 32. And as a result of the latter's big-hitting, South Africa collected 152 runs in the final 13 overs and 97 runs in the final eight overs. In the 36th over, de Villiers was dropped on 38 by Williamson off Anderson. The right-handed batsman jumped on the chance and recorded his 46th fifty in 32 balls. However, the target was not enough as New Zealand crossed the target by displaying fearless brand of cricket.